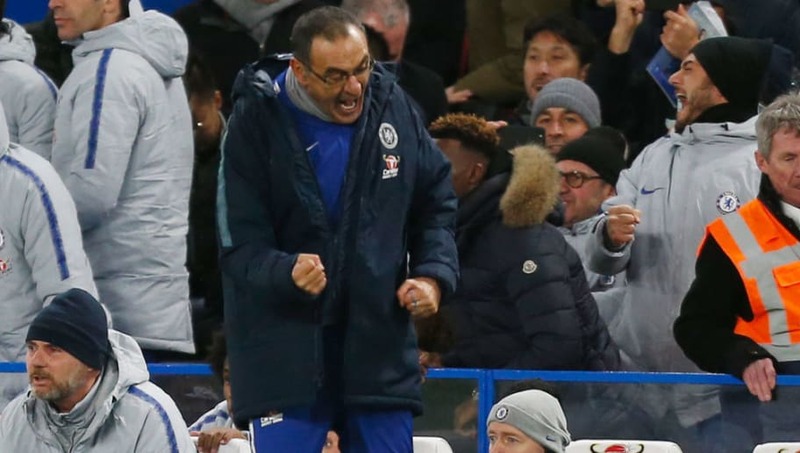 ​Maurizio Sarri has praised his Chelsea side for turning the tide in a tough encounter against Manchester City in the Premier League, insisting that the Blues deserved their win on Saturday. Pep Guardiola’s visitors were largely the dominant side in the first half at Stamford Bridge, but Chelsea rode the champions’ storm and snatched the advantage on the stroke of half time to inspire and opportunistic win for the home side. “We’re very happy with the win, we know it’s not easy to beat City in this moment. N’Golo Kante hit Chelsea’s emphatic opener just before the end of the first half to decisively swing the tie in the Blues favour, before David Luiz sealed the three points with a well taken header from a corner in the second half. Though Chelsea matched the technical and physical levels of City increasingly as Saturday’s match wore on, the Blues are still seven points adrift of the champions and fourth in the league table. Sarri’s men appear significantly adrift of what looks to be a two-horse title race between City and Liverpool at present, and the Italian acknowledged that his side still have work to do in order to reach the standards set by Guardiola’s side. “I think it’s impossible to close the gap in one season. You can play one match but in a competition of ten months it’s very difficult. I think they are the best team in Europe. We won today but we have to say we were a bit lucky in the first 25 [minutes] because they could have scored.